You want a walk in bathtub pillow cushion riser that fits your tub perfectly. You don't want it to slip and slide around. 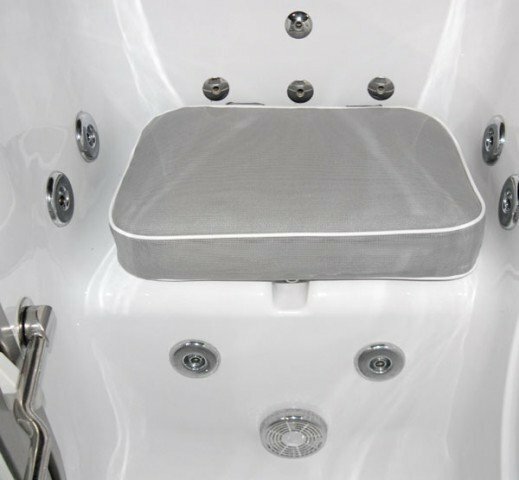 Our seat risers come standard with built in suction cups to help keep your bath cushion securely in place. They are made to order for your specific size and needs. Bathers can enjoy seat risers up to 8″ tall on standard orders. You tell us the height, width, depth and radius of the seat riser cushion you want. Material: vinyl coated polyester, Moisture, mold and mildew resistant. Perfect for home spas and walk in baths, this luxuriously thick pillow is incredibly comfortable. This bathtub pillow can be used as riser or additional softer seat support in bathtubs. We only sell premium quality walk in bathtub seat riser cushions. Bathtub pillow, seat riser cleaning instructions. Release the suction on the cups. Never pull on the cushion while it is attached to the tub. Prepare the cleaning solution by mixing 1 tbsp. of liquid dish detergent and 2 tbsp. of household bleach in a gallon of water. Clean fabric with a sponge or soft cloth dipped in the cleaning solution. Rinse thoroughly with clean water and air dry.